Geospatial One-Stop map viewer integrates map services to display the National Map basemap, Meteorlogix real-time precipitation data, and National Weather Service imagery. Geospatial One-Stop has adopted and promoted a simple vision: to support decision making by providing easier, faster, and less expensive access to geospatial information for government officials and citizens. The centerpiece of the Geospatial One-Stop strategy is the portal (www.geodata.gov), designed to facilitate publishing and searching of metadata and enable viewing of live Web mapping services (see "Geospatial One-Stop Portal Is Key to President's E-Government Strategy" in the Summer 2003 issue of ArcNews for background information). Can the Geospatial One-Stop portal deliver on the promise to support decision making? The first opportunity to test the premise arrived on September 16, 2003, as Hurricane Isabel approached the outerbanks of North Carolina. This article offers some observations and preliminary lessons learned from the experience. Events unfolded something like this. The annual conference of the National States Geographic Information Council was underway in Nashville, Tennessee, when it became apparent that Hurricane Isabel's track would impact the East Coast, potentially affecting 50 million people. More than 200 members of the geospatial community from across the nation were gathered in one place when Geospatial One-Stop posed the question: "What do you think we can organize by working together through geodata.gov to support the response to Isabel?" The partnering network began, and over the next 24 hours contacts were made back home to federal, state, county, and private sector organizations to canvas existing map services relevant to the hurricane planning and response. Esri staff, who provide hosting services and development support for the current geodata.gov portal gathered URLs supplied from contributing partner organizations and worked tirelessly to organize the services, maps, and links to relevant Web sites into a new portal channel-Hurricane Isabel. By the time the storm made landfall on September 18, 2003, the site was in production with more than a dozen services available through Geospatial One-Stop. In less than 48 hours the geospatial community responded with useful, real-time services based on data sharing. Participating government organizations included federal agencies (Geospatial One-Stop/Federal Geographic Data Committee, National Oceanic and Atmospheric Administration, National Aeronautics and Space Administration, United States Geological Survey, Department of Homeland Security, Housing and Urban Development, and the Bureau of the Census) and states (Delaware, New Jersey, North Carolina, and Pennsylvania) that cooperated with local counties. Private contributing partners included several news services, Esri, and Meteorlogix (who offered real-time weather service). Users of the portal could access storm tracking, modeling, and river condition information from the National Weather Service, satellite images, and regional and local live mapping services as well as news alerts and links to disaster planning Web sites. The integrating power of geodata.gov was apparent through the availability of the National Map as a basemap option and the ability to overlay real-time precipitation and weather data (updated every 10 minutes) through the map services made available by Meteorlogix. Without exception, members of the spatial data community were willing to work together and, with Geospatial One-Stop, make their information available through the geodata.gov portal in response to Hurricane Isabel. Each participating organization, public and private, is to be commended for its willingness to set aside other priorities and contribute. State geographic information (GI) coordinators were key to establishing data sharing partnerships in response to this event and are critical sources of knowledge about local mapping services. An ongoing and trusted network between local, state, and federal agencies will be a key component to the long-term success of geodata.gov. Federal and state GI organizations can respond quickly to a common goal when technology makes sharing easy. 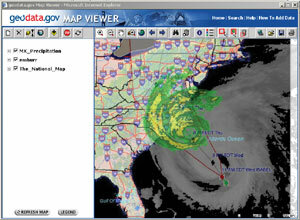 In the case of Hurricane Isabel, publishing existing agency map services and data was easy through the geodata.gov portal. There are many existing mapping services that can be accessed easily and quickly to support disaster planning, response, and recovery. The Geospatial One-Stop portal is an effective tool to search and view these services and maps when the services are published in the portal. The technology is reliable and worked well under crisis conditions. It is much more effective to publish and organize map services and data before an event occurs. Time is needed to effectively organize content, instructions for users, etc., to maximize the utility of services for citizens and decision makers. The experience with Hurricane Isabel proved the utility of Geospatial One-Stop as a source for geospatial information in support of a natural disaster. More important, it is apparent that the geodata.gov portal can potentially support all kinds of activities and decisions. The limiting factor is the amount and quality of mapping services and data sets that are searchable through the portal. The geodata.gov portal needs to be populated aggressively with metadata describing mapping services and GIS data sets if we as a community are to fully experience its value. Become a publisher! Register your GIS data and Web services now at www.geodata.gov. For more information, contact Hank Garie, Geospatial One-Stop (tel. : 703-648-5569, fax: 703-648-5755, e-mail: hgarie@usgs.gov).